The Rescue Van was generously donated by the Earlene and Robert Neuway Legacy Fund to aide in reducing pet overpopulation. Cause for Paws, Inc., volunteers use the van to transport animals to other shelters and rescues for adoption. 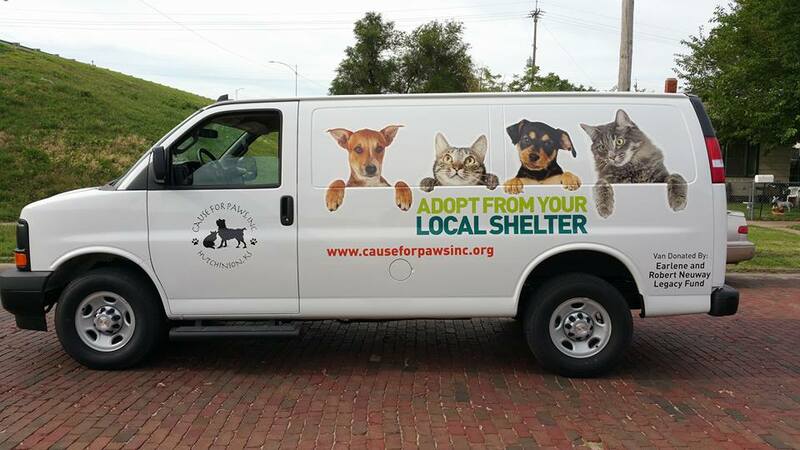 A partnership between CFPI and the Hutchinson Animal Shelter jointly provide the van's upkeep for transports done for the Hutchinson Animal Shelter. Sometimes emergency transports are needed. Maybe there is only a small window of time to make a cross-country connection so a pet can get to their new home. Perhaps the transport is urgent because of medical/health issues. Whatever the reason, CFPI has been asked to transport them to another location so the animal has an opportunity to be adopted!